hey, you can do this! Of course your retirement plan should be about you. But simple and convenient? We think it should be all that and more. That’s why we developed plynty. Whether it’s how much you have or how much you need, plynty guides you to a plan that works with your lifestyle. It links all of your accounts so that everything is laid out in front of you, all in one place. And, yes, it’s affordable. 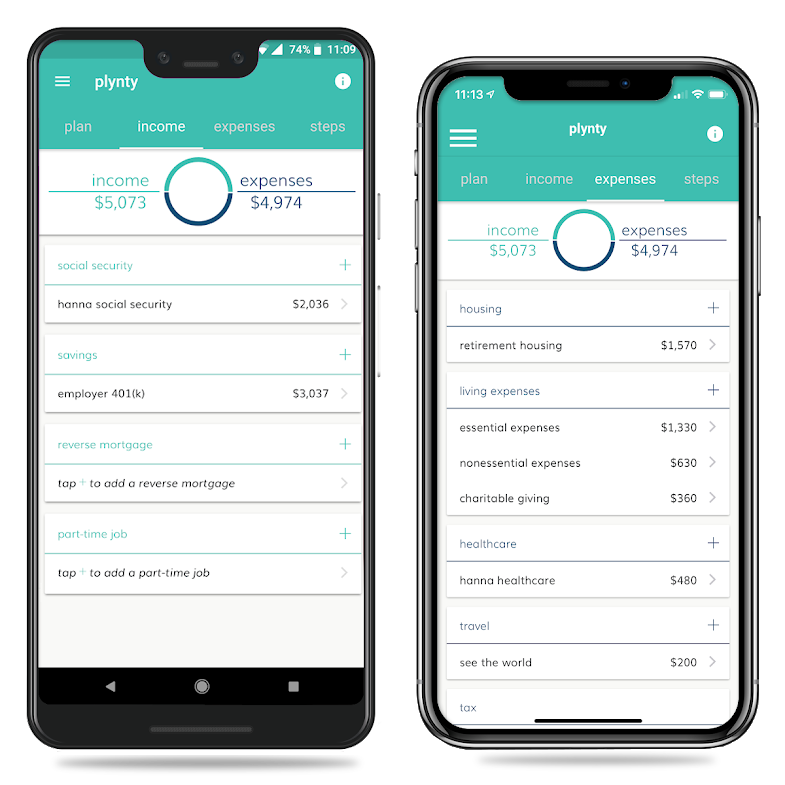 With plynty, you get a powerful financial planning platform with visibility into your retirement cashflow and how you’re future is shaping up. you already understand this — really! You probably already manage your money on a regular basis, tracking how much you earn and spend. Yep, whether you write it down or guesstimate, you likely have a good idea of what comes in and where it goes. This is your everyday cashflow. Since that’s the way you plan for today, that’s the way plynty helps you plan for retirement. No intimidating techniques. 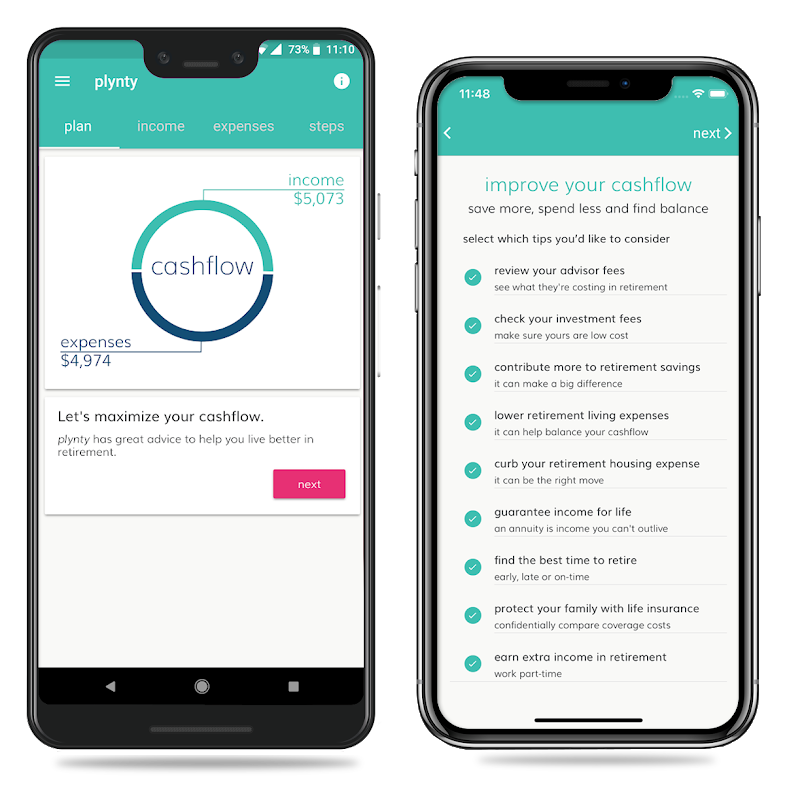 plynty builds off your familiarity with cashflow and allows you to understand your future cashflow as clearly as you know today’s. It’s what we call “lifelong cashflow™”. After you enter your information, plynty is just getting started. You can choose to activate features that will bring everything together, shop for products that match your needs, and track your plan. Anytime. All from the app. Set retirement goals best suited to the life you live, track your progress, and easily change your plan as needed. Receive personalized quotes on recommended products from low-cost partners who share our vision. Link your investment accounts together for a comprehensive view of your lifelong cashflow. Imagine a financial time machine: step into the future, see what you’ll need, and come back with the right retirement plan. plynty can help take you there. future you’re creating every day. minimal fees and maximum value. how will I spend my retirement? continue with plynty in your pocket. With proven technology and expertise, plynty defends every detail of your data. Access to your account is protected by multi-factor authentication. Our powerful and proven infrastructure and administrative controls keep your data safe. Our dynamic safeguards are approved by a leading cybersecurity firm. We will never sell, rent, or share your personal information — ever. For additional information, review our Security Supplement. start using the plynty app today.